You can vary this recipe how ever you want by adding different veggies. Tonite I chose an orange pepper, red onions, and olives. First saute the meat with preferred seasonings. I used garlic powder, Ms. Dash seasoning, salt, pepper, red onions, a drizzle of Balsamic Vinaigrette, and a drizzle Olive Oil. While sauteeing the chicken put the crust in the oven to heat up. 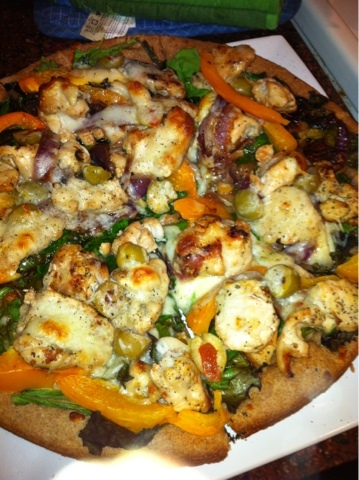 I used a wheat thin crust pizza dough. Let the dough warm up and then take it out, drizzle it with Olive Oil, and place toppings. 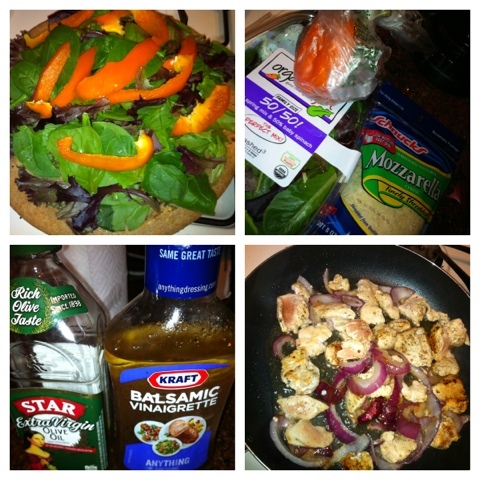 I used mixed field greens, an orange pepper, green olives and then the chicken and onions. Lastly i drizzled Mozzarella Cheese on top (optional) and then stuck it in the oven for about 15 minutes. Take it out and serve yummy yummmmy!!!!! 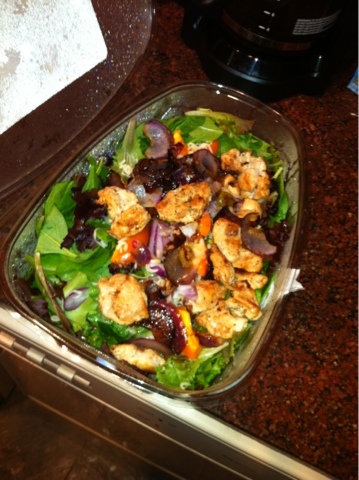 I had some chicken mixture left over so I made Kenny and I a salad for lunch tomorrow!